Home » Around the Farm » Corny Facts! We, at Green Thumb Farms are often asked “what is the difference between the corn you grow and the corn we eat?”. We stumbled upon this website by The Family Farm Project which helps to answer that very question. Dent corn is often used as livestock feed, in industrial products, or to make processed foods. Dent corn is also frequently referred to as “field” corn. Either white or yellow, dent kernels contain both hard and soft starch that become indented at maturity. Flint corn, also known as Indian corn, is used for similar purposes as dent corn. Flint corn is distinguished by a hard outer shell and kernels with a range of colors from white to red. (You can remember that it has a very hard exterior by thinking of flint, the stone.) Today, most flint corn is grown in Central and South America. Sweet corn is primarily eaten on the cob, or it can be canned or frozen for future consumption. Sweet corn is seldom used for feed or flour. Sweet corn is extra sweet because it contains more natural sugars than other types of corn. (Field corn contains 4% sugar at the same stage standard sweet corn contains 10% sugar.) Almost 50% of the sugar can be converted to starch only 24 hours after sweet corn is picked, so it is best to eat it fresh! Flour corn is used in baked goods because it has a soft, starch-filled, kernel that is easy to grind. Flour corn is primarily white, although it can be grown in other colors, for example, blue corn. One of the oldest types of corn, flour corn was a chief type grown by Native Americans . Popcorn, a type of flint corn, has a soft starchy center surrounded by a very hard exterior shell. When popcorn is heated the natural moisture inside the kernel turns to steam that builds up enough pressure for the kernel to explode. When the kernel explodes the white starchy mass that you like to eat forms. All types of corn will pop to some degree, but they won’t necessarily have enough starch to turn inside out, or an outside layer that will create enough pressure to explode . One of the oldest forms of corn, evidence of popcorn from 3600 B.C. was found in New Mexico! 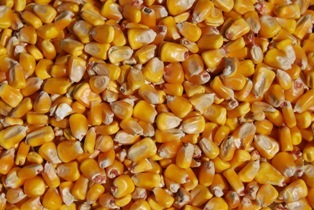 In addition, feed (dent) corn usually grows much taller than sweet corn, the kernels are more of an orange color compared to the yellow kernels of their sweet corn cousin, and feed (dent) corn is harvested in the Fall when the kernels have had ample time to dry in the sun compared to sweet corn harvesting in mid summer when the kernels are in their milky stage. Green Thumb Farms grows Dent corn and it is mostly sold as feed for animals, it also can be used to make corn meal and other edible products. Dent corn can also be used as a heat source much like wood pellets. The kernels are stripped from the cobb during harvest the kernels are dried to a moisture content of between 12-14% and cleaned to remove the chaff (flakes of the cobb). The dried kernels are now ready to be dumped into a stove or furnace for heating purposes. With your newfound corn knowledge, next time you see a field of corn see if you can tell what kind of corn it is! I currently purchase your popcorn in bulk through Associated Buyers. Do you have any other pick up areas or distributors that I can purchase wholesale bulk popcorn from in New Hampshire? We do not grow popcorn any longer. All of the inventory that we did have has been sold. Sorry!